This summer, the first of July marks the centenary of the Battle of the Somme, which was such a major event in the First World War that, to most British minds, it remains unequivocally the worst tragedy of a calamitous conflict that was subsequently termed ‘The War To End All Wars’. While the battle continued until November, it was the first day that was the most disastrous, when the British Expeditionary Force took the heaviest casualties ever suffered by one army in a single day’s fighting. Casualties were some 57,000 on the British side, of which 19,000 were deaths, many mown down by unremitting German machine gun fire and constant artillery bombardment as they tried, heroically yet impossibly, to advance across No Man’s Land through an impenetrable tangle of defences. This was warfare on an industrial scale in which Kitchener’s legions of volunteers marched manfully to oblivion. 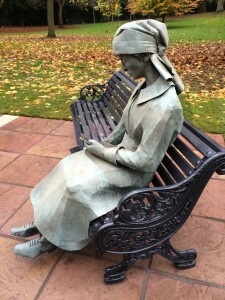 Many survivors of this horrendous experience – and indeed of the wider conflict – felt compelled to record or otherwise create a personal response to it. Their reactions encompassed a huge range of complex feelings, expressed through the outlet of poetry and prose, and also in all forms of art. 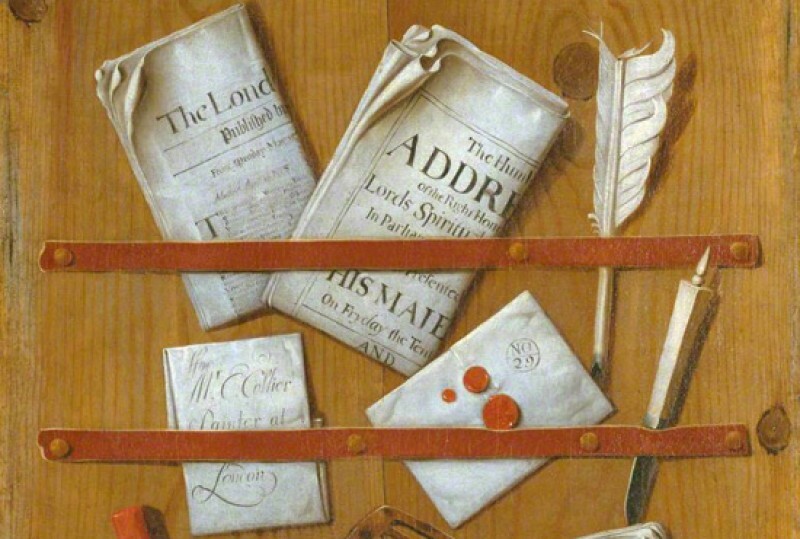 It is not surprising that the body of work in oils thus created, for example, is so very disparate, and that a search of Art UK’s website of paintings, including as it does a number of military collections (and most notably for this period, that of the Imperial War Museum), presents a wide gamut of treatments. One such is the Scottish landscape and portrait painter James Gunn’s The Eve of the Battle of the Somme, a near-idyllic scene of bathers relaxing by a river on a summer’s day. It is the ordered rows of military bell tents half hidden under a leafy canopy in the background – and the title - that gives the game away: the irony is painfully clear. 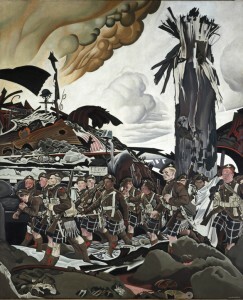 Gunn saw action in France, serving with the Artists’ Rifles (28th Battalion London Regiment), and later holding a commission in the 10th Bn Scottish Rifles. He survived to become President of the Royal Society of Portrait Painters. More traditionally, the Irish-American photographer and naturalist, Arthur Radclyffe Dugmore, painted an illustration of the battle, selecting the critical moment at 0730 hours on 1 July, when platoon officers’ whistles sounded up and down the 20-mile line announcing the start of the British assault. Despite being over 40 years old, Dugmore had used influence to secure a commission in the King’s Own Yorkshire Light Infantry, and later published an account of his period in the trenches, When the Somme Ran Red. Although not an active combatant on the day, he was present in the Somme trenches and his Troops Going over the Top (Battle of the Somme) was based on his eyewitness recall of the soldiers’ experience on that day. The painting shows British infantrymen being exhorted to leave their trenches to advance across open land towards the German line, which is marked by the swathes of smoke and bursting artillery shells in the distance. Some of them have already been shot while getting out of the trench; one collapses over the barbed wire a few feet away from its edge, while another nearby drops his rifle at the moment of a bullet’s impact. Only one or two have made it as far as the patch of blood-red poppies in the middle distance and where the expanse of enemy barbed wire entanglements began. This may not be the most technically accomplished work of art perhaps, but the artist manages to convey in visual terms something of just what it was like to be there. Evoking a different view of the battlefield is Cecil (CCP) Lawson’s oil on panel painted in 1916, simply titled Somme. Lawson served on the Western Front in the Westminster Dragoons (2nd County of London Yeomanry) and produced many oil paintings and sketches throughout the conflict. In this work his palette is dominated by greys and browns, lightened by the pale blue of the cloudy sky and its faint reflection in the water filling a shell crater in the foreground. In a scumble of dark brown, two artillery gun limbers gallop through a desolate landscape of stick-like trees and mud, past two small, makeshift crosses marking the burial place of fallen combatants. In fact, the slaughter on the first day of the Somme was so great that, after noting the identity of the dead (when possible), they were usually buried wholesale in communal pits. In detailing some of the paintings engendered by the Battle of the Somme, mention must be made of the official war art scheme and those artists who were specifically commissioned to record different aspects of the war, inevitably making them witnesses to the experiences of soldiers. 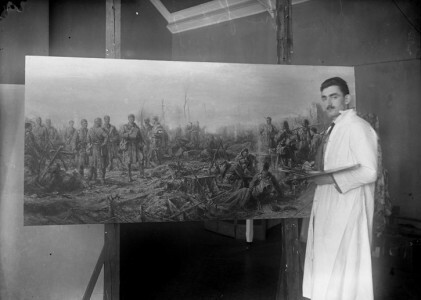 For example, John Hodgson Lobley was commissioned by the Royal Army Medical Corps to record significant events in that unit’s history, and his oeuvre includes scenes of casualty clearing stations at the front and at many hospitals, including the Queen’s Hospital for Facial Injuries in Kent. Notably he also recorded the cheering, flag-waving crowds who gathered to welcome wounded soldiers returning to London from the Somme in his Outside Charing Cross Station. 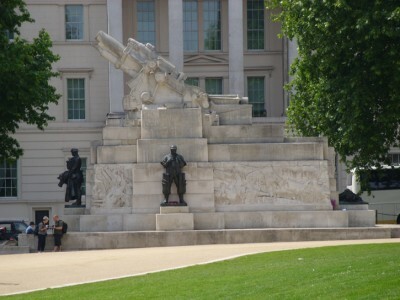 It has been suggested that by choosing to depict a scene close to Parliament in the heart of the capital, with a stream of ambulances containing ‘defeated’ men, the artist intended to reproach the government. Whether or not that is so, it is known that Lobley was deeply affected by what he saw, and this scene may also have been a patriotic acknowledgement of the sacrifices made by these men. After 1 July, there were a further eight ‘phases’ of the Battle of Somme until its dismal ending on 18 November 1916, during which time some 416,654 British and nearly 200,000 French soldiers had become casualties. * In assimilating the barbarity of this inhuman ordeal at the time, and since, a body of immensely powerful literature was created that has helped to fix this event firmly in the public consciousness. In different ways, the art that it inspired may also have shed light on that reality. Postscript: my own grandfather was present at the Somme on 1 July 1916, but his battalion was held in reserve for an attack later in the day that was called off because of the carnage. Although he was a career soldier who had seen action the previous year at Gallipoli, he never spoke about the first day of the Somme, not even to his eldest son, although he, too, was a soldier when they later walked the battlefield together.